Amid a growing humanitarian crisis in Europe and the Middle East, Israeli Prime Minister Benjamin Netanyahu on Sunday refused calls to admit non-Jewish refugees from Syria and announced plans to build a “security fence” to shut out people fleeing war—directly referencing concerns that admittance would skew demographics. “Today, we are starting to build a fence on our eastern border. In the first stage, we will build it from Timna to Eilat in order to protect the airport being built there, and we will continue the fence up to the Golan Heights, where we have already built a strong security fence,” the statement continued. The prime minister’s statement came a day after Isaac Herzon, opposition leader, called onIsrael to allow entry to Syrian refugees. Not only is Syria an immediate neighbor of Israel, but the countries bearing the brunt of the refugee crisis—Lebanon and Jordan—also share a border with Israel. Lebanon is now home to approximately 1.2 million refugees from Syria, amounting to roughly one out of every five people currently residing in the country. More than half of Syria’s population is currently displaced—with seven million internally uprooted and four million fleeing to other countries. Some of those now fleeing Syria are Palestinian refugees. Israel has driven millions of Palestinians from their homes, through expulsions, ethnic cleansing campaigns, war, and occupation. On Saturday, Palestinian Authority President Mahmoud Abbas called on Israel to grant Palestinian refugees fleeing Syria safe passage into Palestinian territories. Netanyahu’s refusal follows growing condemnation of Israel’s brutal treatment of tens of thousands of non-Jewish asylum seekers fleeing war and poverty in sub-Saharan Africa—mostly Eritrea and Sudan. Israel is not the only country to refuse entry to refugees. 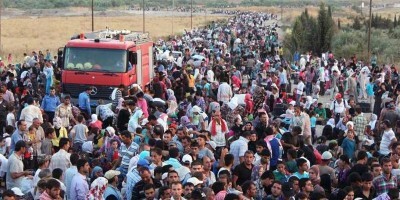 Its close ally the United States has admitted just 1,500 Syrian refugees since 2011, and in 2013, the last year for which Homeland Security statistics are available, granted asylum to a mere 36. And wealthy Gulf monarchies including Bahrain, Kuwait, Oman, Qatar, Saudi Arabia, and the United Arab Emirates have welcomed few—if any—Syrian refugees into their country. Further, Israel is not the only country building a fence to keep refugees out. Hungary’s far-right Prime Minister Viktor Orban has built a razor-wire fence along the border with Serbia and is preparing to reinforce it with military and police deployments.